A weekly review of news and developments in the world of human-robot interaction. “Built tough”: That’s the slogan used in ads for Ford trucks, which are shown hauling massive loads, towing equipment, and roaring across rugged terrain. But the workers who assemble those trucks in Ford’s manufacturing plants are subject to human frailties. They can suffer from back and shoulder pain as a result of carrying out the repetitive tasks required by their jobs, particularly as they work on chassis suspended above them. Ford estimates that some assembly workers lift their arms about 4,600 times per day, or about 1 million times per year. So workers on Ford’s assembly lines in two U.S. factories are getting some extra help. 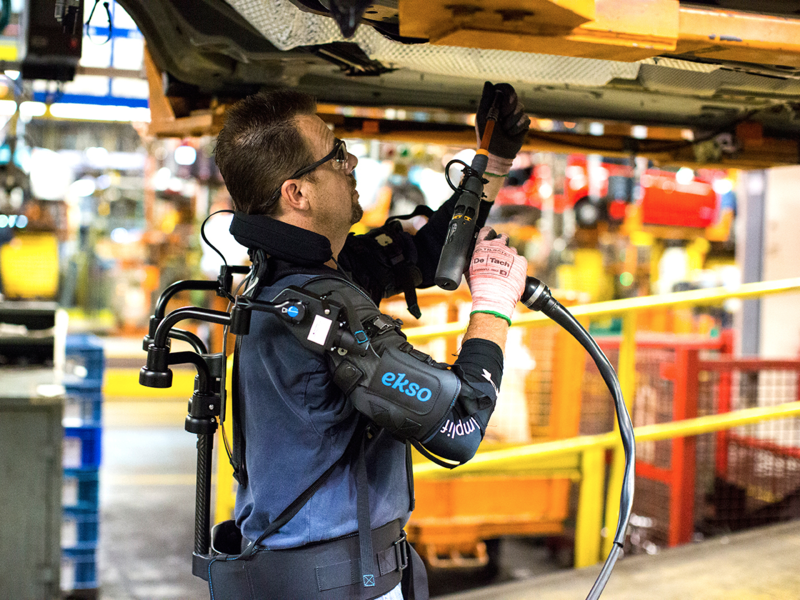 In a pilot project, the workers are suiting up with the EksoVest, an upper body exoskeleton from the Bay Area company Ekso Bionics. Ford plans to expand the test to factories in Europe and Latin America. Ekso Bionics is primarily known for its work in the medical sector: The company sells a lower-body exoskeleton that enables paraplegic people to walk again. What if no worker ever got injured in the workplace again? Every year, approximately 3 million US workers (of over 130 million employed) sustain workplace injuries that lead them to file workers compensation claims for medical treatment and lost income. Those claims add up to hundreds of millions of dollars in payouts and untold productivity losses to business and industry. And, that doesn’t even begin to depict the human costs of the pain, disability, and death caused by industrial accidents every year. Here’s what we know: robots can definitely help stem these human and financial costs. Almost daily we hear bold predictions about AI and robots eliminating thousands of jobs around the world. The predictions lead to plenty of FUD (fear, uncertainty, and doubt) for workers, leaders, and economists alike. The logic of these predictions is compelling: companies will look to cut costs by eliminating human workers when automated substitutes become viable. But, businesses don’t flourish by cutting costs. Oh, cost cutting will raise profitability in the short run, but thriving companies almost always take those cost savings and invest them back into growth opportunities. Add to those savings the reductions in unemployment compensation insurance and company-paid disability claims, easily over $100 billion annually in the US last year. That tells me that when the kinds of jobs that are injuring workers today can be performed by robots, insightful leaders will create new ways to deliver greater value to their customers, and create the jobs those new ways will require. It’s hard for us to imagine a world in which the vast majority of dangerous and dirty jobs are done by robots. After all, human toil has been the source of income for people throughout history. But, when automated systems can perform all the “heavy lifting,” leaving it to humans to use our creative, flexible, cognitive and physical skills, our current acceptance of millions of workplace fatalities and injuries will seem barbaric. Likewise, taking for granted more than 40,000 annual fatalities and 4,000,000 roadway injuries in the US in 2016 will seem bizarre when autonomous vehicles safely move millions of people per day on our streets and highways. When we think about a future in which we are living amongst millions of job-capable robots we often find ourselves at a loss to imagine how our own lives will play out. One thing seems certain: a lot fewer of us will be killed or disabled in the workplace as the most perilous jobs are taken over by machines. In the midst of our fears over these developments, it’s important to remember that progress means leaving behind activities that were only necessary because there were no safer, faster, cheaper ways to do them at the time. What we’ve done before is invent new ways to entice one another; there's no reason to believe we won’t do so again. But, this time without so much risk to life and limb. If you're not subscribed, please sign up here. 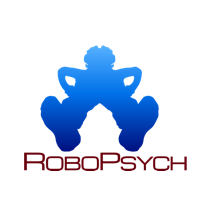 Be sure to subscribe to the RoboPsych Podcast!